People are upset at phone manufacturers for taking their sweet time sending out software updates. That's understandable. It's why commenters laughed at Sony for releasing Android 5.1 to some of its phones several months after Marshmallow was available. It's why customers are pissed that Motorola isn't standing by some of its cheaper handsets. And apparently it's why a consumer advocacy group is suing Samsung in the Netherlands. NOS.nl reports (via auto-translation, so please forgive any small errors) that the Dutch Consumentenbond is taking Samsung to civil court over a lack of consistent updates to its Android-powered phones. Among their grievances are the absence of a proper update schedule and no vital Stagefright security updates for some currently-sold devices. The group is demanding that Samsung support phones with new software updates (and, it's implied, the latest version of Android) for two years after the retail purchase of the phone. Right now Samsung somewhat dubiously promises to offer support (as in, "this thing probably won't stop working for no reason") for two years after the product launch, with no mention of when the user actually bought the phone or tablet. Samsung notes that there are believed to be no cases where attackers abuse made from Stage Fright leak. 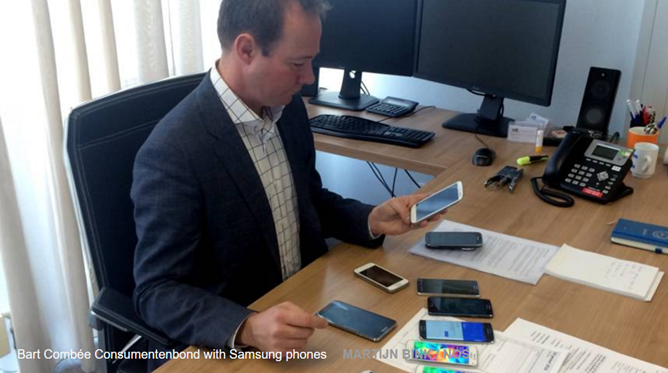 "It's a theoretical problem," said Gert Jan ter Haar from Samsung. "We think that problem is made larger than it actually is." Also, two-thirds of the phones that Samsung released since July 2013 already protected against this problem, the company said. Ouch. Samsung, just so you know, the fact that no one has busted through my front door yet isn't a valid reason for leaving it unlocked, even one third of the time. This attitude towards the security of your phones isn't doing you any favors. And for the record, Stagefright was revealed to the public last July, half a year ago. That said, a lack of updates is a rather unfortunate reality in the smartphone world, where the two-year upgrade cycle (or at least the idea of that cycle) refuses to die. A two-year-old flagship can probably handle the latest version of Android and the majority of apps that run on it, but mid-range and low--end phones (which are on the short end of the software upgrade stick anyway) usually don't fare so well. Requiring Samsung to support hardware two years after a retail purchase is probably a non-starter - someone could sell an unopened first-gen Galaxy S, and that sale would tacitly require Samsung to develop, test, and release a Marshmallow build for a phone that can't even run it. The odds aren't with the consumer advocates on this one. Samsung's user agreements tend to cover these sorts of complaints, and even if the case has merit, the company's army of legal goons will descend upon the Netherlands like Hitchcock's Birds to keep any result of the case from requiring consistent, company-wide action on their part. It's a long shot, but maybe - just maybe - this will get Samsung to try and make phones that are designed to be used for more than 18 months at a time. But I wouldn't bet on it. If your Dutch is a little rusty, here's a press release from Consumentenbond in English (PDF link). Thanks, Henning! Bart Combée, director of the Consumentenbond: ‘On buying a Samsung Android device, consumers are given inadequate information about how long they will continue to receive software updates. The Consumentenbond is demanding that Samsung provide its customers with clear and unambiguous information about this. Samsung moreover provides insufficient information about critical security vulnerabilities, such as Stagefright, in its Android phones. Finally, the Consumentenbond is demanding that Samsung actually provide its smartphones with updates.